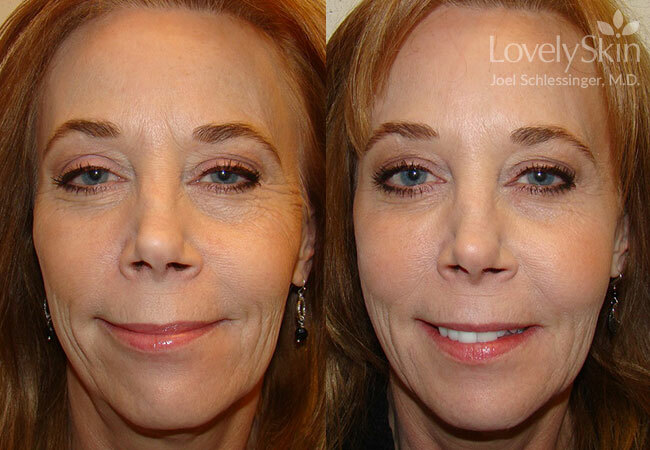 Dr. Schlessinger can smooth wrinkles around your mouth and cheeks or add volume to your lips with Juvederm filler. Omaha JUVÉDERM Treatment: What is JUVÉDERM? And is it right for you? Wrinkles and creases on the face are inevitable as we age naturally. Squinting, frowning, and even smiling also hasten the formation of unwanted wrinkles. What happens is that the underlying collagen and elastin fibers in the skin begin to break down and wear out. Not to worry. Those wrinkles can be addressed with a number of natural products known as fillers. One of the most popular fillers is called JUVÉDERM®. Other similar products are Belotero, Restylane® and Perlane®. Restore lost volume for a more healthy apperance with JUVÉDERM. Fillers are made of hyaluronic fluid - a natural substance that is already present in your skin. 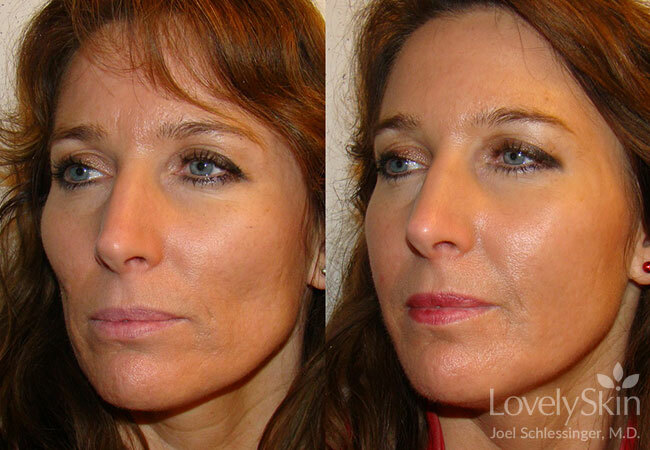 These fillers are introduced underneath the skin's surface using a tiny injection that lasts only seconds. Fillers can be used in a variety of places such as the lips, mouth, and circles under the eyes, and for acne scarring and cheek depressions. Fillers can also be used in the lines that run from the nose to the corners of the lips and down to the chin as well (the "jowls"). Before and after filler injections. Board-certified dermatologist, Joel Schlessinger, MD, of Skin Specialists and LovelySkin.com, has been offering his patients JUVÉDERM® since its approval for use in the United States. The product has been widely used in Europe before that. He is a national expert and lectures widely on the subject of wrinkle relaxers and wrinkle fillers. 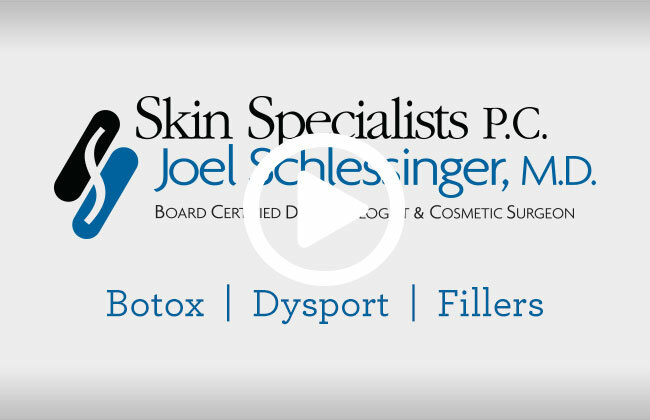 Dr. Schlessinger does all of his own injections and does more fillers including JUVÉDERM® and wrinkle relaxers such as Botox and Dysport than any physician in Omaha. His Midwest clinic also is one of few select sites in the nation to conduct FDA-approval trials for wrinkle fillers, and he has done research work for JUVÉDERM® as well as for Botox and Dysport. In his practice, Dr. Schlessinger uses different kinds of numbing techniques in the area of the injection to make the procedure much more comfortable for his patients, allowing this to be done over a lunch hour if necessary. Having more experience with wrinkle fillers such as JUVÉDERM® and wrinkle relaxers such as BOTOX® and Dysport™ than most cosmetic surgeons in the nation, Dr. Schlessinger is the natural choice to go to for this procedure. JUVÉDERM® is a natural, synthesized, and fully degradable FDA-approved hyaluronic acid. JUVÉDERM® contains hyaluronic acid in the form of a crystal-clear gel. It is injected into the skin to lift the lip, smooth wrinkles, or fill in a fold in the skin. Once in your skin, the gel creates volume, resulting in a more healthy and vital appearance. When injected into the lip, it can restore a more natural and sensuous look. In contrast to other biodegradable implants, JUVÉDERM® is not extracted from animals. This means there is no risk of allergic reaction. Therefore, it is perfectly safe to use instantly without pre-testing. Hyaluronic acid occurs naturally in the body and therefore it also dissolves naturally with time and is integrated into your body's tissues. The effects of wrinkle fillers such as JUVÉDERM® can last months. JUVÉDERM® nicely fills fine lines on the upper and lower lip that are not severe enough to require laser resurfacing. Deeper wrinkles and folds in the cheek areas (these are the nasolabial, melolabial lines at the corners of the mouth) also respond well using JUVÉDERM® and other wrinkle fillers. Lip enhancement has up to twice the longevity of standard collagen implant treatments. The treatment is performed by injecting JUVÉDERM® under your skin. Since no pre-test is needed, your procedure can usually be done in less than one hour. Many patients like the added comfort provided with an anesthetic cream, while others prefer an anesthetic block. This makes the treatment relatively painless. Dr. Schlessinger recommends that patients stop taking any aspirin or aspirin-like products about a week or so before the procedure to decrease the likelihood of bruising. This would include Motrin and Aleve (Tylenol would be okay to continue). Some patients may experience slight bruising at the injection site, which can be covered with a little makeup. Talk with Dr. Schlessinger prior to your procedure about your goals for using JUVÉDERM® or another filler and feel free to ask any other questions regarding cosmetic procedures. Dr. Schlessinger and his patient coordinator are very willing to answer questions and want to hear from you if you have any. Your results will depend on your overall goal and suitability. Dr. Schlessinger is very diligent about letting patients know if they are good candidates for treatments and choosing which treatment and products may work best. Depending on the area treated, most folds and wrinkles require one treatment. The repeat maintenance treatment is not usually required for approximately 6 months or longer. By experience, these products last almost twice as long as regular collagen injections. The great thing about JUVÉDERM® is that you can replenish your natural beauty whenever you feel the need. Unlike permanent implants, JUVÉDERM® always leaves you a choice when the effect of the treatment has worn off. A touch-up can be performed any time you like after the previous treatment. There is no set timeline on how long a filler lasts. It all depends on how much is injected and the areas that are injected. JUVÉDERM® is a patient-friendly procedure. One thing to remember is that JUVÉDERM® is like an ice cube in your body. It dissolves slowly, much like an ice cube dissolves in water. So it doesn't go from there to not there in one moment, but over months and months. You may have fillers injected at the same office visit along with Botox or Dysport. If you are taking antibiotics, there should be no problem continuing them if you have this procedure. But talk with the doctor about all medications you are taking. There is no set timeline on how long a filler lasts. It all depends on how much is injected and the areas that are injected. If you put a very small (or too small) amount in, you won't get a good result, and it will last a very short time. Patients who say their results don't last may be asking an injector to do too many areas. Or the injector is unskilled and injects fillers in the wrong place, which results in a very short length of activity. It is important to go to a dermatologist or plastic surgeon who actually does his or her own injections and has the skills to perform the procedures with the right amount of product in the correct areas. 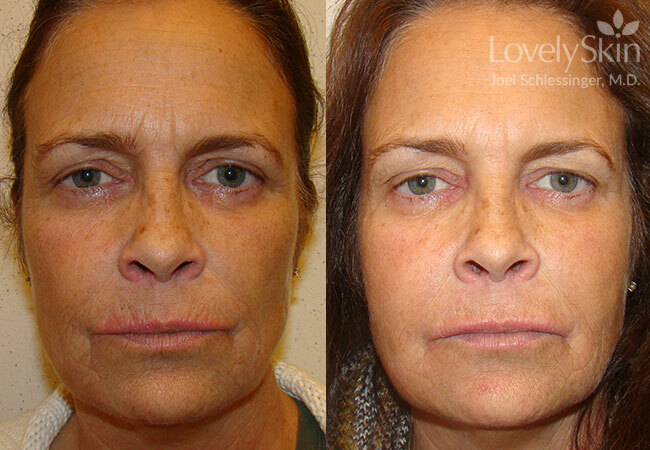 Before and after Botox, 2 Voluma, Perlane, Juvederm, Restylane, Belotero. You will have a consultation in the comfortable and high-tech office in Omaha, Nebraska of the patient coordinator, meeting with Dr. Schlessinger to answer any questions you might have. Dr. Schlessinger will perform the injections. In Dr. Schlessinger's office, the only individual who works on you is the doctor - no nurses or other staff members administer fillers or other products such as wrinkle relaxers as is the practice in many other offices. Dr. Schlessinger is very proud of the results he obtains, and this is one of the reasons he has consistently been voted Best Cosmetic Surgeon in Omaha, Nebraska. Dr. Schlessinger adds a super potent topical numbing medicine with the filler, and a topical numbing cream is applied as well. The actual injections are quick and nearly painless, and Dr. Schlessinger uses a slow and steady technique refined over the thousands of procedures he has performed. A very small amount of JUVÉDERM® is injected with an ultra-thin needle very precisely into several areas. Most patients compare the sensation to a little sting. Discomfort is minimal. The treatment site may have a little swelling, which may last a few hours. Slight bruising, if it appears at all, can be covered with makeup. Depending on the area treated, JUVÉDERM® can last up to 6 months or longer. If the lips are treated, initial swelling and tenderness may occur within the first few days, but subsides after 2 or 3 days. Other wrinkle fillers are Belotero, Restylane® and Perlane®. The differences among these products - Belotero, Restylane, JUVÉDERM®, and Perlane - are very minor. Dr. Schlessinger sometimes uses one or the other depending on patient preference. Belotero - an alternative to JUVÉDERM® - is great for very fine lines on the lips as well as etched lines on the face. Contact Skin Specialists today for more information. Are there side effects of JUVÉDERM injections? The area where the injections are done may be a bit tender and swollen, but this shouldn't keep you from your normal daily routine. Make sure you have discussed all medications you are taking with the doctor before the procedure. Some may cause bruising and should be stopped well before the procedure. Be sure to avoid taking ibuprofen (Aleve), aspirin, and herbal supplements for up to 2 weeks prior to your visit if you can. Temporary bruising can occur. Lips can be particularly sensitive to bruising. You're more likely to have less bruising with a very experienced injector. Cold compresses can help here. While fillers such as Restylane, Perlane, Belotero and JUVÉDERM® have clean track records, there are some fillers such as scuptra, artefill, and Radiesse that have a few problems. JUVÉDERM® can be reversed if you are not pleased with the results. Radiesse, a calcium-based product, can stay for years and can be painful when injected. When you get into a long-term or permanent filler, there can be problems. For this reason, Dr. Schlessinger uses only temporary wrinkle fillers. While the area around the eye responses very nicely to JUVÉDERM®, it can also have major problems and require redos or removal of the product. Dr. Schlessinger also suggests to patients who target this area to try something like Obagi's ElastiDerm, which works quite nicely and helps with these areas without major injections. While it won't lift, this product does seem to help with the darkness around the eyes. Talk with Dr. Schlessinger or your doctor during your consultation about whether this procedure is right for you. If you live in the Omaha, Nebraska area, Dr. Schlessinger would welcome your call at 402-334-7546 for an appointment to discuss treatment with wrinkle fillers and wrinkle relaxers. If you live elsewhere, consult with a dermatologist who specializes in cosmetic dermatology and does his or her own treatments rather than handing them off to a less skilled practitioner. It takes skill and technique to get the really good results from wrinkle relaxers and fillers. Typically that means that you have to have an MD, and usually a skilled dermatologist or cosmetic surgeon, do the procedure. Dr. Schlessinger sees the poor results when patients go to fly-by-night clinics for their procedures. Solutions are diluted significantly. They aren't as potent, and the technique is poorly done. The results in these cases often make patients look worse rather than better. As a board certified dermatologist, Dr. Schlessinger performs all of the treatments on his patients. If you go to a clinic that is run by a reputable dermatologist and/or cosmetic surgeon, these professionals should be the ones doing the treatments.